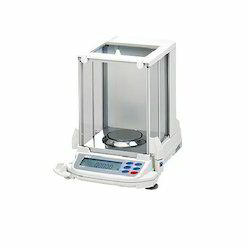 Our product range Analytical Balances by Shinko Denshi, that is ideal for weighing light weights. It is easy to use as the object to be weighed can be just put on the platform and the accurate result can be obtained in no time. Here we offer a huge range of balances from laboratory micro balances to semi micro balances, from analytical balances to high-performance balances, from Industrial balances to flame proof and moisture. Balances are designed to meet the specific weighing requirement in the laboratory working environment. These balances come in precision designs and operating characteristics that allow making quick and accurate measurements. Here, our expertise also lies in making these available in both standard and custom tuned specifications.